Thirteen Indigenous students from around the country visited The University of Melbourne’s Parkville campus for the second annual Indigenous PhD Familiarisation Program in August this year. Hosted by the Melbourne Poche Centre for Indigenous Health, the Program is the first of its kind and involves a series of PhD preparation workshops targeted at helping students who are considering applying for a PhD. With many of the students in attendance expected to apply, along with the six Indigenous PhD students who enrolled previously, the Melbourne Poche Centre is on track to achieve its goal of enrolling at least 20 Indigenous PhD students by 2020. The Program ran for five days and provided participants with the opportunity to engage and network with many Indigenous professors and current PhD students, as well as work on research ideas as a cohort and with prospective supervisors. It aims to make potential PhD students aware of study options and the strong Indigenous networks that exist at the University. The University of Melbourne is extremely fortunate to have some of the most distinguished Indigenous academics in Australia, who were particularly generous in donating their time to lead workshops over the course of the Program. It is also particularly important for participants that the Program is Indigenous-led and has broad support from across the University, including funds provided by the University's Hallmark Indigenous Research Initiative. The Program ended with a celebration dinner focused on advancing Indigenous scholarship hosted by the Vice-Chancellor, Glyn Davis. 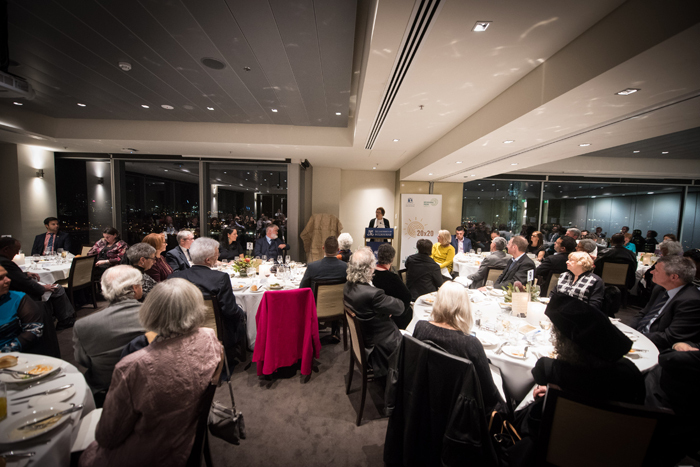 The event was attended by a significant number of Indigenous professors, post-doctoral researchers, and PhD students and included a keynote address by visiting Maori scholar, Professor Linda Tuhiwai Smith. Governor of Victoria, the Hon Linda Dessau, and partner Judge Anthony Howard were also special guests at the event, showing their support for Indigenous advancement at the University. Initial feedback from participants suggests the Program has been incredibly valuable for Indigenous graduate researchers. The positive empowerment provided through the supportive, cohort-based learning with Indigenous academics was reflected in feedback provided − one participant said ‘networking with amazing people was inspirational’, while another said the program ‘provided a valuable insight into the challenges of graduate research study’. The Melbourne Poche Centre expects a significant increase in the number of Indigenous PhD applications submitted over coming years as a direct result of the Program, particularly in health sciences but also across other areas of the University such as the Victorian College of the Arts and the Melbourne Graduate School of Education.